As one of your most prominent features, the nose can have an extraordinary impact on your looks. As such, subtle, artistic alterations by a seasoned facial plastic surgeon, like Dr. Mark R. Murphy, can transform your appearance – bringing balance, harmony and beauty to your features. 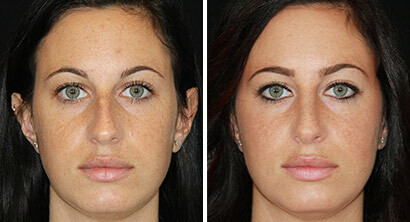 If you are looking for one of the best rhinoplasty Boca Raton and West Palm Beach have to offer, Dr. Murphy is for you. Rhinoplasty or nose job, is a surgical procedure that helps address your nose, both aesthetically and often functionally. Rhinoplasty can be used to address a prominant hump, downturned or overly upturned tip, snoring caused by deviated septum, and much more. Why Choose Dr. Mark Murphy? Dr. Murphy specializes in the aesthetic and scientific aspects of facial plastic surgery and is considered one of the top facial plastic surgeons in the Palm beach area. With over 10,000 surgeries and years of training and experience, he is one of the best options to achieve optimal results from rhinoplasty and facial rejuvenation surgeries. As a double board-certified facial plastic surgeon, his focus and area of expertise is the face and neck, and he endeavors to create esthetics ideal to enhancing your natural beauty. You will instantly feel at ease with his expertise and knowledge and he will help you to develop a plan to make your own desires for enhanced, natural looking beauty a reality. Dr. Murphy is proud to offer two unique Boca Raton rhinoplasty techniques to his patients in West Palm Beach: the open and closed approach. With the open approach, he will make an incision along the columella, which is the structure separates your nostrils. He will then lift the skin to reveal the cartilage and bone of the nose, so he can precisely shape and sculpt the area. This approach provides Dr. Murphy with the greatest access to the underlying structure. As such, it’s best for our clients who want to dramatically change the appearance of their nose or make very refined changes to the nasal tip. With the closed approach, Dr. Murphy will create incisions inside the nose only, eliminating the potential for external scars. Although this approach still enables him to fix many cosmetic and structural problems, it does not allow for the unobstructed access the open approach provides. As such, it won’t be the ideal technique for every patient. Regardless of the specific approach used, you can be assured that you are receiving one of the best rhinoplasty West Palm Beach and Boca Raton have available. Dr. Murphy will operate using the conservative approach for which he is known. He won’t attempt to dramatically change your appearance, because he knows that’s not what will appear the most natural. Instead, he’ll make very subtle alterations with the goal of ensuring that you still look like yourself when you emerge from surgery, just with a more attractive nose that better fits your face. After your rhinoplasty Boca Raton with Dr. Murphy, you should expect to stay home from work for at least one week as you recover. During that time, it’s important to keep your head elevated, avoid strenuous exercise and regularly apply cold compresses to your face. Throughout the initial recovery period, some puffiness, bruising and swelling is to be expected, though it will subside with time as you continue to heal. A few days after surgery, Dr. Murphy will have you return to our Palm Beach Gardens office so that he can evaluate your nose and make sure your healing process is progressing as planned. At that point, he will provide you with personalized guidance regarding when you can return to work and more strenuous activities. Depending on the requirements of the procedure the procedure typically costs between 4,000 to 10,000 dollars. Will Rhinoplasty Affect Nasal Allergies? It won’t affect your body’s response to allergens but receiving rhinoplasty and being exposed to allergens directly after surgery may intensify the reaction or cause greater discomfort for a period. Surgery can last from one hour to several hours depending on the extent of the work being done. How Long is the Recovery from a Nose Job? Full recovery is expected to take a few months, but the initial swelling and bruising should subside within the first week or two. When Can I Go Back to Work Following the Procedure? It is important to avoid potential bumps or harm to the nose, so restricting your activity is crucial in the first week at least. Depending on the type of work you do you could be back to work within the first week. The rhinoplasty can be done with minimal to no scarring depending on the type of procedure recommended for your specific case. In a closed rhinoplasty (appropriate for minor corrections), the incisions are within the nose. In an open rhinoplasty, the incision is in the columella, the strip between your nostrils where it won’t be visible once healed. After any surgical procedure involving anesthesia it is always recommended to have someone pick you up and drive you home – you cannot drive yourself after rhinoplasty. Rhinoplasty can be performed using various types of anesthesia such as IV sedation or general anesthesia. Some minor corrections may require only local anesthetic. Yes, there is also non-invasive rhinoplasty which involves the use of fillers and injectables as opposed to surgery. These options can be discussed with us to determine whether non-surgical rhinoplasty will work for you. Financing is available, and depending on the cost of the procedure, different options that can suit your needs can be discussed with our friendly administrative staff – they are here to help.